Last year, I dusted off my slow cooker and made my first batch of apple butter. While it tasted incredible, I realized (after the fact) that I cooked the apples way too long. I was left with a mere cup of apple butter from 5 pounds of apples. That sure was some thick, concentrated apple butter, let me tell you! This time around, I did things differently. Mainly, I cooked it for a fraction of the time. Not only was it much, much faster, but I was left with five cups of creamy apple butter. It’s also naked. Minimal spices, no sweetener. The blonde roast of apple butters! Most apple butter recipes call for 2-4 cups of sugar, but I wanted to make a batch without any sugar. Yes, sugar does help increase the shelf-life and also thicken, but my version seemed to turn out fine. 1) Sweet + tart apples. For the best-tasting apple butter, use an equal mixture of sweet and tart apples. I used Granny Smith, Sunrise, Fuji, Honeycrisp, and Mac apples. Use any varieties you wish, the more the better. Each time you make apple butter, it will taste a bit different depending on the apples you use. Of course, local, in-season apples will make your apple butter even better (say that 5 times fast). I used 5.5 pounds of apples, but feel free to make a smaller batch if preferred (cooking time may vary). 2) Cinnamon. I used about 1/2 tsp ground cinnamon for this batch, but if you’d like a more flavourful and darker apple butter, add as much cinnamon as you prefer. You can also throw in cinnamon sticks as it cooks or try adding ground cloves, nutmeg, and ginger. Some people like to add a spice packet to the mixture. Just grab cheesecloth and add in whole spices and tie it with cooking string. It is very easy to remove this way. 3) Lemon Juice. I added a tiny bit of fresh lemon juice, to taste. This will help extend shelf-life a bit. You can also add apple juice or sweet apple cider, but I didn’t bother for this batch. I don’t find it needs any added sweetener when I use around 50% sweet apples, but feel free to add sweetener if your taste buds prefer. I like it a bit tart, with a light sweetness. When we cook down the apples, it concentrates the sweetness, so it will taste better as it cooks. A little bit of maple syrup would go a long way here. As always, I’m giving you chatty detailed steps, photos, and tips, but the actual process is very easy. I like to talk, what can I say. 1. Slice apples. There is no need to peel the apples. In fact, your apple butter is much healthier with the peel left on. Don’t worry, we’ll blend it all up and you won’t even know the peel is in there. Tip: If you have an apple slicer, now is the time to use it. I love this OXO divider. Or if you have a food mill, I hear you can cook the apples whole and then run it through the mill. You make the call. 2. Set slow cooker on HIGH for 4 hours with the lid on. During those 4 hours, give it several stirs as the apples tend to stick to the bottom. You can add some apple juice or cider to prevent sticking. If you’d rather cook it longer on a low heat, you can do that too. 3. Mash apples and turn off heat. After 4 hours, most of the apples are soft enough to mash up with a wooden spoon or potato masher. After mashing, we now have applesauce (with the peel of course). 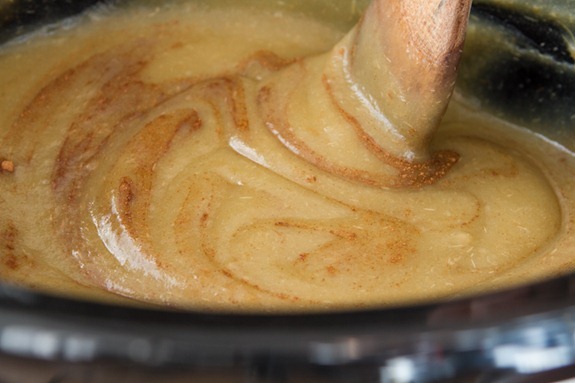 It will look similar to this after blending – it’s like the silkiest apple “sauce” you’ve ever tasted, but not quite thick enough for a butter yet! 6. Pour the apple butter back into the slow cooker. Turn heat on high and cook down, uncovered, for another 45-75 minutes until it’s as thick as you desire. After 45 mins, I was left with 5 cups and the consistency was very similar to my pumpkin butter. Keep in mind it will thicken very slightly once chilled overnight. 7. When ready, add cinnamon to taste. I didn’t add much so the colour of my apple butter stayed very light. You can also stir in a tiny bit of lemon juice now too, but this is optional. To email, print, or text these directions, click here. Of course, the best thing about making apple butter (next to eating it) is experimenting with different flavours. 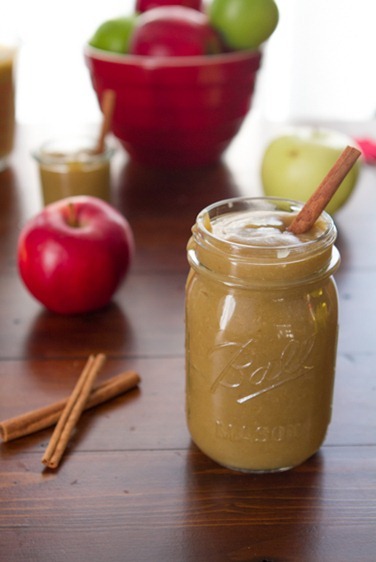 Try adding cinnamon sticks, freshly ground nutmeg and ginger, or even other fruit & veggies like pumpkin or pears. Next on my list might be a pumpkin apple butter hybrid…or apple pear…or butternut squash & pumpkin…hmm. Homemade butters also make fun host/hostess gifts. Make it a couple days in advance and spoon into Mason jars with a cute ribbon and tag. I like to either write out the recipe or simply write the URL to the recipe if there isn’t enough room. I brought a jar over to my friend’s place last night and it was quite a hit! I’m not certain how long this will last in the fridge since this is my first batch made this way. I will be sure to update this post with how long it lasts for me. If it’s anything like my pumpkin butter, it will hopefully last for at least 3 weeks in an air-tight jar in the fridge. As for canning or freezing, I haven’t tried it myself. For you canning pros out there – do you think this can be canned? As always, I appreciate your thoughts below! For many ways to enjoy apple butter, see my pumpkin butter list. What kind of fruit/veggie butter should I try next? 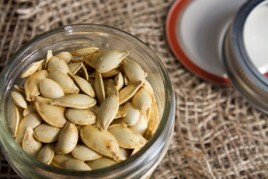 You should try a “blonde roast” fig butter next! fig butter has been on my list for a while….great idea. Hello yumminess! I’ve been loving apple baked goods over the past couple of weeks now that apple season is in full swing. I’m definitely thinking an apple pear butter would be awesome – I love spiced up pears almost as much as apples this time of year!! Once the apples are cooked down the acid is concentrated just like the sweetness so, yes, it cans beautifully. If you ladle it hot from your cooking pot into sterile jars and immediately into the water bath, it will only take about half an hour, max, to get the butter hot enough to seal those lids tight! This can be safely water bathed–10 to 15 minutes. Looks delish! You can definitely can this — apples are acidic enough that a simple water bath canning process should work. No sugar is necessary! I completely agree–you can definitely can your apple butter. I have several jars of last year’s apple butter still sitting in my pantry, and (as of the last one I opened) they are still delicious. Would adding lemon juice, help the canning process? Keep it fresher longer? First timer here. ☺️ Hoping to make some today and can it. Thank you Danielle, so glad you enjoyed it. I made this today and I think it is wonderful. But my DH doesn’t like apple butter or applesauce so I added some cinnamon red hots candy and it made it even better. He decided that he liked it then. So I canned the jars in a water bath. You are the butters queen! The pumpkin butter had me so excited but now this one has me just as happy. It’s so smooth and rich looking! I want to dive into that jar! Wow this looks amazing, I love that it has no sugar, so brilliant. It’s solo creamy looking. Beautiful photos. Amazing! There was no way I’d find apple butter (in my price range anyways) down here in Florida so I will be making this Saturday night while the boy is out with his friends. Can’t wait! This sounds (and looks) delicious! Can I still make it if I don’t have a slow cooker? Absolutely–you’d just need to be watchful the entire time and stir often. Medium heat until applesauce, then med/low until the right consistency. A heavy duty pot is best, for holding and distributing heat evenly, but any pot will do. It won’t take as long on the stove, but again, you have to be very vigil, unlike a slow cooker. Good luck! I’ve also heard you can cook down the apples in the oven. Thanks to both Keenzi and Angela! I can’t wait to try this out! Mm, I haven’t had apple butter in ages… looks like it might be time to break out the slow cooker! I cannot wait to try this – and your pumpkin butter! This looks so great! Oh sweet holy baby pears are you giving me ideas!!! You are awesome, so beautiful! I was trying to make apple sauce last night but ended up with apple butter when I chopped a bunch of apples and added homemade apple juice to the pot. Boiled for 45 minutes. 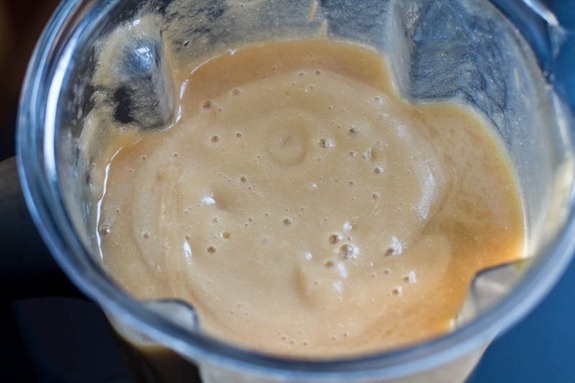 Blended… and apple butter consistency all the way. So awesome! Thats the best when you discover something fun like that. I usually don’t have to worry about the shelf life of apple butter, because I can’t feed it to my kids fast enough. It’s one of those things that is gone in a few hours, or at least the first day. Do you think adding coconut oil to it would be good? I would think the coconut oil would firm up in the fridge, so I probably wouldn’t try it. Of course, if it’s heated it would melt again. I was thinking it may help to thicken it up, but then I suppose it might be harder to spread…. Im sure it would be tasty regardless ;) I think it could harden kinda chunky, but if you dont mind that then go for it. It could always be heated again to melt it. I think I’m going to make a jar of this and a jar of your pumpkin butter for the Mr’s b-day party next month. Biscuits are involved and this would be the perfect topper! I love apple butter on top of biscuits! I wonder how pear butter would turn out. I’m not sure if the gritty texture would impact the consistency but I’d try it! I made pear butter a couple weeks ago in a slow cooker and it was yummy! Sugar and lemon juice and cinnamon to taste. This looks great. When do you add the fresh lemon juice? Feel free to make less…you can use any amount of apples you want. I used 5.5 lbs but its not necessary to use that amount. I hope someone comments about freezing it too…I’ve heard you can, but havent tried it. Yep, you can freeze it. I don’t have the patience for my husband to teach me how to can things…so I go the quick route and just throw it in the freezer. Just be sure to let it cool before you put it in the freezer. I froze a lot of applesauce last year and I used the last jar in February and after 5 months it still tasted good! This would be perfect for teacher gifts this Christmas! I wonder how it would turn out adding in some almond butter with the fruit. I can’t wait to give this a try and I bet your house smelled fabulous! Did you try adding almond butter? I have some macadamia nut butter I was thinking about blending in. This looks incredible! And its perfect timing because I went apple picking last week and have A TON… literally…of apples on hand right now! Perfect way to use some of them up before they go bad! But thats not likely because I am an apple fiend lol! Looks so yummy Angela!! Now I want to go apple picking first (are there even any available to go to around us this year? ), and then make this deliciousness. That and pumpkin butter. Then maybe I’ll turn into butter myself – which wouldn’t be so bad, would it?! Hey Jo, Apple butter is cooked down much longer than applesauce. Essentially, it’s a condensed form of applesauce, in a way, and is much more thick. Does that help? Yes, thank you that makes sense now. The word ‘butter’ sounds so much more rich and decadent, which I guess it is really :-) I need to get onto making me some ‘butters’! Yes it does and it’s so fitting. If you compare it to aplesauce (which I did actually in a taste test) the apple butter was so much more rich and creamy. I meant to take a side by side photo. Oh well, next time! Can I use an immersion blender if I don’t have a regular blender? My pops has been offering to buy me a VitaMix for some time but I haven’t taken him up on it, so my only bladed appliances are an immersion blender and a large food processor. 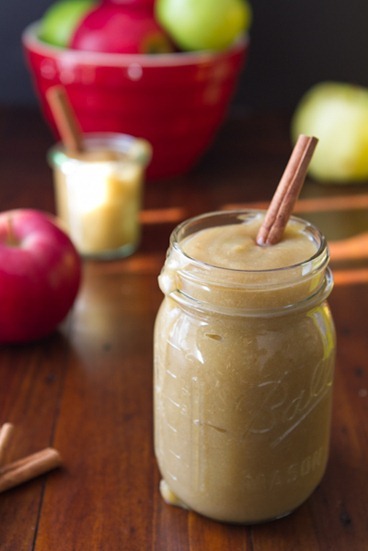 But I have been craving apple butter and this looks so easy and good! Those immersion blenders are designed for blending soup while it’s still hot. No need to wait for cooling. 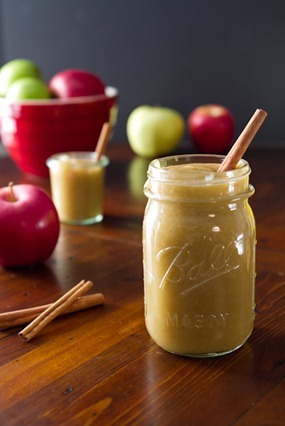 I’m in the process of making this right now and I just used my immersion blender to blend up the apples. I just made sure to mash them by hand really well first. Right now I have the lid off and it is thickening as we speak. I also added a small cinnamon stick while the apples were cooking and will add a little more ground cinnamon at the end. I will admit that I’ve already had a few taste tests and it is delicious! looking forward to seeing some recipes using the butter soon I hope?! OH HECK YES! I’ve been wanting to make apple butter, but don’t have time to stand over the stove all day! WOOHOO! Heh, blonde roast. I’m forwarding this to my best friend, who is obsessed with her new slow cooker. Your apple butter looks delicious! I bet pear would be great, too! oh yum, now that is a fruit I rarely use! Are they in season now? I dont even know. Delicious!! Looks so wonderful. I will have to try this. This is gorgeous! It’s so silky smooth. Just one more thing on my list of things I love about my Vitamix. :-) I’m excited to make this, because I dislike the high amount of added sugar usually in apple butter. Happy fall! I need to make homemade apple butter — that looks so delicious, Angela. Thanks for sharing! I made apple butter yesterday in the slow cooker. I canned it in a water bath when I was finished. The key with canning is clean jars, hot product (the apple butter) and the right acidity of the finished product. I placed the hot apple butter in the clean jars (250ml size) and removed the air, wiped the lid clean and put on the snap lid. Then I processed them in the canner for 10 minutes of boiling water. (the water will stop boiling when you first put the jars in start the timer when the water comes back to a boil) When you take them out wait 12 hours and make sure the lid has popped down. (My lids pop usually within the first 30 minutes but you aren’t supposed to disturb them when they first come out and after all that work I will listen to the book!) Then they are good for the shelf. Benardin claims they are good for 2 years if you use the lemon juice. Thanks for the tips Jennifer! Apple butter must be in the air ;) I still have to try that recipe you sent me with the spice infused pumpkin seeds! Oh, may I please have the recipe for the pumpkin seeds? I am a huge fan of anything pumpkin! I LOVE the simplicity of this Ange! Because I’m a cinnamon junkie I think I’d have to up the quantity of it a bit, but other than that this sounds amazing!! Honeycrisp apples are my all-time fave and I can’t wait until it’s officially apple season. Do you think it would work over low heat on the stove, rather than a slow cooker? Great photos! I cant see why it wouldnt work, I will have to try that next time! Any idea if it can be done without a high-speed blender, or will this just result in “less-smooth” butter? I recommend blending it (in any blender) if you can so the apple peels can pulverize. That being said, you could probably peel all the apples first if you dont want to blend it. It would be much less smooth but would still work. Also Ive heard some ppl use an immersion blender. Or you could try putting the apples in a food processor before cooking? let me know how it goes if you end up trying it out. I left mine with peels and cooked them down and then blended them in the food processor and they cam out great. I love that this doesn’t have any added sweetener. I bet it would be wonderful on toast in the morning! I do love pumpkin butter but the apple is a nice change. Love how this recipe uses the slow cooker. Thanks for sharing! I wish I could eat your pictures some days…that apple butter looks delicious!! Definitely on my list of things to make! I’ve never eaten apple butter? How do you eat it, like applesauce or just as a spread on bread? Thank you Iris, that means a lot to me. Congrats on starting a blog – I will head over and check it out! Seriously want this right now!!! My friend Kelsey has a HUGE apple tree in her yard. Time to get picking! I would kill for an apple tree!! hah. This looks delicious! any suggestions for those of us without a slow cooker? Do you think you could just do it on the stove in a pot over a low heat? Yes I do think you could do iton the stovetop. I think another reader commented with suggestions yesterday, I would check out her tips if possible. I will have to try my next batch with the stovetop! I’ve also heard you can do it in the oven…will have to look into it more. Hey Sara, Thank you so much. I appreciate your encouragement so much and I’m so glad you enjoy the recipes! Thanks for reading. I would bet a roasted kabocha butter would be divine! As soon as you made pumpkin butter, I thought, “Hey, we could improve on this…” and set to work in the same direction as you. Only difference is that I reversed what you did: put cored, unpeeled apples in the Vitamix on high until smooth and warm, poured batches into the slow cooker, added the cinnamon, covered it with a spoon propping the lid open, and walked away for an entire day. It was fabulous! Thanks for what you do. You inspire a lot of us in Pennsylvania! I cut them into chunks and turn the blender all the way to “turbo” speed, pushing down hard at first with the tamper. Once it gets going, you can let it run until the sauce gets hot and the color a little darker. 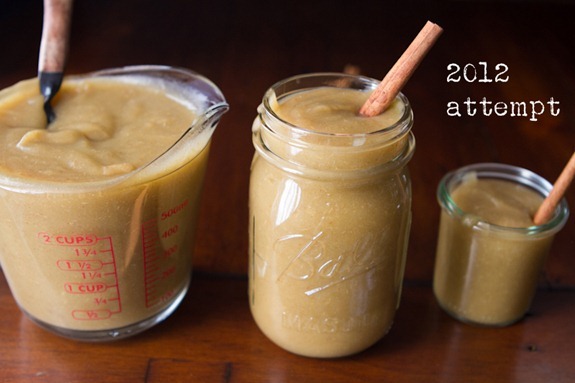 Instant applesauce at this point – we do this all winter long for dessert. Thanks I will have to try it again. My apples were in slices so maybe that was the issue! What a wonderful recipe!! I love apple butter!! 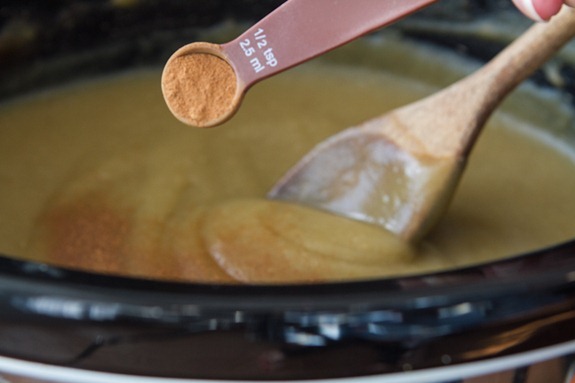 I love this no-sugar, slow cooker version of apple butter. I don’t like added sweetener in my apple butter and am itching to break out my slow cooker for the first time this season. Plus, I just bought a boatload of a variety of apples from the farmer’s market! 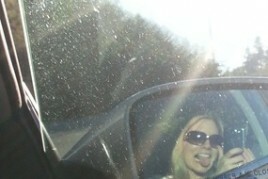 Great timing! This looks so incredibly simple.. and with no sugar?! I just may be making this this season! 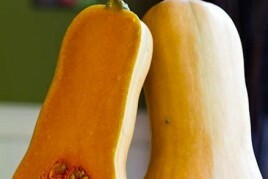 Would love to see a butternut squash butter.. that sounds delicious. This sounds wonderful! I’ll have to make it the next time I plan for company – I bet it makes the entire house smell heavenly. Made this last night delish and to think I did not like apple butter (only had store bought before). Do not can either so I hope I can use it all up b4 it goes bad. Love this recipe! Probably going to try it this weekend with some Fuji Apples. Wondering if the consistency would change depending on the type of Apple you use? Fuji’s are usually a little more tart than your standard red apple. Wonder if peaches/nectarines would be too soft a fruit to try? Have you ever tried to make homemade apple cider? I recently did a post on it and it is RIDICULOUSLY easy. Like, took less than 10 minutes easy. You definitely need to give it a try! that looks good! What do you do with the leftover pulp? I (unsuccessfully) tried to make granola bars. I’m sure you would have much better luck! I also thought the pulp would marry nicely in some sort of fruit and nut energy ball. Maybe mixed with peanut butter? 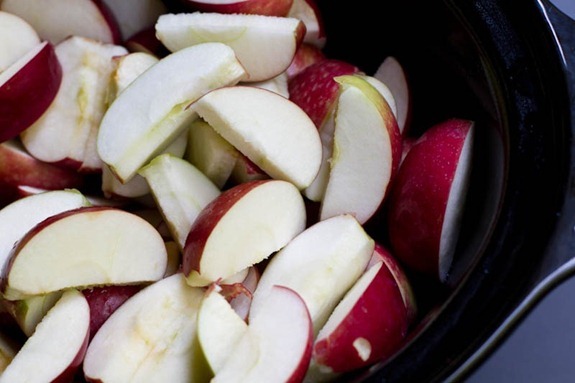 Love this recipe, made it last night… One tip, grease the crockpot with coconut oil before adding the apples and they don’t stick at all. I purposely did not stir during cooking time just to expiriment. Works perfectly! OMG Definately going to try this!! I make stewed apples in the slow cooker all the time, but just freeze it chunky so i can do what i like with it once defrosted. I have never had apple butter in my life, you cant find it here in New Zealand so once we are finished this batch of apples im off out to buy more haha. Theres a place i get apples for .69c a KG, which is about .55c US? SO cheap! Love it. Bookmarking this right now! I want to make it this weekend :) looks great! Thanks for the recipe! TBW (the beautiful wife) and I love apple butter (or pumpkin, or pear, or peach, or etc…) and have some apples we need to do something with. Sweet potatoes are also about to come into season; it’s not a fruit but it makes a wonderful butter. Could probably also use any of the winter squashes: Acorn, Blue Hubbard, Butternut, etc. Great idea :) I like how you think! love love love apple butter making season! we have a huge apple tree in the yard that never fails to produce! i did just cinnamon, nutmeg, and pinch of allspice last year but i am gonna add some grated ginger this year for a kick ;) ! i never would have thought to add lemon of for longer shelf life – great tips! thanks again OSG! my apple butter spent from 10am – now 1130pm in the slow cooker… and it is still the consistancy of apple sauce? I’ve had it sitting for the last 4 hours with no lid on …. to much water you think – suggestions? I did nothing different from last year… and it was so thick!!! weird…. Hmm..I’m not sure why that would be. did you pop it into the blender to blend it up smooth yet? Maybe try adding a bit of sweetener to help get things going? yay so glad to hear that!! I made this recipe this morning – OH MY WORD!!! It is soooo delicious and simple!! Thanks Angela! Love all your recipes!! I’d love to see Fig Sauce on your website!! Sounds great and so much easier than how it’s usually made here in East TN, outside over an open fire in a huge kettle! Lovely! I am a huge fan of just letting the fruit’s natural sweetness speak for itself.. This would be heaven with a little natural almond or peanut butter on a nice crispy piece of toast. I’ve got a batch of this in my slow cooker right now Angela! I’ve only ever made apple butter on the stove top before – thanks for a great idea. My house is smelling like pure apple goodness right now Mmmmm! I will probably be eating it like pudding for the first while, lol. Last year I made a batch of apple butter with a splash of champagne vinegar – it added a nice tangy punch to the rich dark apple butter. I use an immersion blender and it works perfectly. 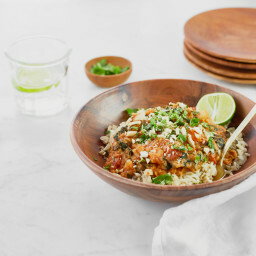 This has inspired me to pull out my slow cooker again! Oh, I’ve got to try this! I’d love to see you cook up something like this using pears. I made this last night and its delicious!! My husband was so impressed and happy!! Im so glad to hear this Shelley! Pretty excited to try this out. I don’t actually have a slow cooker, but I will try and figure it out. My hubby and I are originally from southwestern Ontario but just moved to California for a job offer and guess what they don’t have? Apple Butter! What is up with that? Really? Wow I wouldnt have thought that! Do you have a Trader Joe’s near by? I thought I heard someone say TJ’s has some. Enjoy your time in California! So glad you posted this. I wanted to do exactly the same thing (skins on, no sugar) but I didn’t want to put in all that work only for it to fail. You’ve done it, it works, that’s good enough for me! Thanks! Thanks for the recipe! I tried it out and it turned out delicious! Only that next time I will definitely peel the apples. My blender shredded the apple peels into fine threads, almost like the wooden part of ginger, and it was very throat scratching and unpleasant. I tried blending more, did not help – I had to strain it in the end. But it was delicious, I will have to make it again! Oh, this is fabulous! I also threw in a few pears that were threatening to go bad and squeezed in the juice of two oranges instead of apple juice or lemon juice (I figured it was kind of half way in between!). No spices, no sugar. Yum! Who knew it was so easy? Made this last night!! Spent the whole time worried that I didn’t do something correct! But it is delicious!! I didn’t use any sugar just a bit of a caramel apple cider I had on hand to prevent from sticking and it added just enough I think! Thank you for posting this recipe! I can not wait to have my toddler try it on top of her pancakes this morning…I would much rather use this than syrup!! So glad it turned out for you. I always thought that I was doing something wrong in the past (umm and I did a couple tries!) but it’s so easy once you get the feel for it. Enjoy the rest! I just made this today and I LOVE it. The applesauce alone was incredible and I’m a few minutes and a stir of apple pie spice away from apple butter. I’ll be blogging all about it!!! What an amazing site!!!! I found it on Friday and haven’t put it down!! Once an obsession occurs that’s it I’m in! I am a naturopath from Australia and use these ingredients regulary but you have inspired me to take them to a whole other magical food level…. I’m excited beyond belief…. I dreamt of mason jars and nut butters!! Thank you for an amazing site which will not only enrich my life but my clients as well! 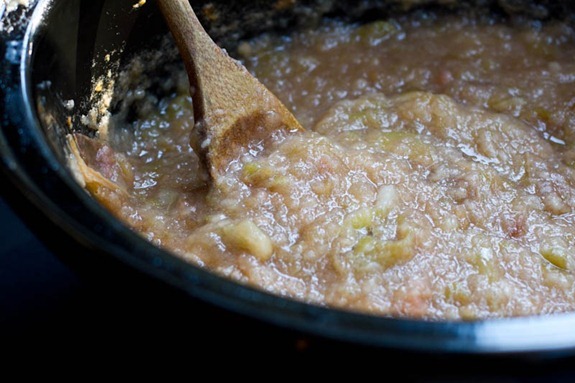 Question – have you had any luck or any advice on freezing the apple butter? I have all these apples from apple picking, and I want to make the apple butter for Christmas presents! Hi Helene, I tried freezing a tiny amount in a baggie this year and it thawed just fine. I think it was in the freezer for 2-3 weeks. enjoy! Wow look at your work… I am a Naturopath from Australia. I found your website on Thursday last week and havent been able to put it down since! Its been truely addictive! I use these ingridients regularly but you have taken them to a level that is inspiring! Thank you I am now a busy bee with mason jars and Apple butter! It has been soul awakening and I know my clients and my family are going to love the new found delisiousness!!!! Its a pleasure to meet you! Thanks for your comment. Hi, I just tried making this apple butter today and it worked out pretty well! The only thing was that I thought it was going to be a bit thicker, from what it looks like in your pictures. I left it cooking for about an extra half hour but it wouldn’t really thicken up. It kind of just got stuck in that super smooth applesauce stage. Any tips, or thoughts on what I might have missed? Thanks! Hi Ali, Mine was the consistency of a thick applesauce, but very smooth from the blending. It should thicken the longer you cook it, so Im not sure what happened. Sometimes it can take an hour or two. Did you ever find out how long this lasted in the fridge? I was hoping to make some at Christmas! Great recipe! I just made this apple butter and it came out delicious. I love the simplicity of it (just apples!) and the different ways you can use it. I will be making more of this. Thanks for posting this recipe. thank you for this. you saved my christmas apple butter gifts. my first batch turned to some kind of jam/jelly… and took 12 hours!! GREAT recipe! although it seems like it takes FOREVER to make…. I gave the apple butter as Christmas gifts to friends and family instead of candy, and everyone raved how amazing it tasted! My family has an organic apple orchard, so I have access to the best fruit. Thanks for this woderful recipe! So yummy. My kids loved it. My VERY picky husband loved it (I added a touch of cinnamon and nutmeg to his)! So great. I would like to make your 2011 version :-) Did you also blend apples while preparing this thick butter? 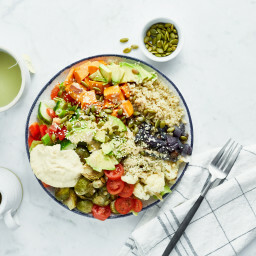 I am a recent convert to vegan lifestyle (24 years as lacto-ovo) and just found your website, love it! I noticed on this post you have questions about canning. I make no sugar with peel apple butter every year for christmas/hostess/teacher gifts. The kids of the families I give them to have come to ask for it mid year. Canning no-sugar apple butter couldn’t be easier. Depending on your altitude using a water bath canner for about 20 minutes should do the trick. I try to can about 40 pint jars of it every fall and it will hold for at least 8 months. I can’t say if it lasts longer because we have always run out by then, but I would guess you could get to at least one year with proper canning. This one is easy even if you are new to canning, a great way to get familiar. I would recommend looking up the time requirements for apples at whatever altitude you are. I absolutely LOVE this recipe! I tried it out as soon as I read this! I love your blog and all your amazing ideas! It’ll make anyone go vegan. I added a couple cinnamon sticks and it was a great choice! I also added some cardamom because I thought it would add to the amazing apple smell, but it didn’t do anything because of the intense smell, which was okay with me. The only thing was that my butter wasn’t very thick, it was more of a thick(ish) apple sauce. If I cooked it longer, would it be thicker? Thank you so much! I’m so happy I found your recipe! The apple butter looks amazing and you’ve made it seem easy to make! I have a quick question- how long does this apple butter stay good for? 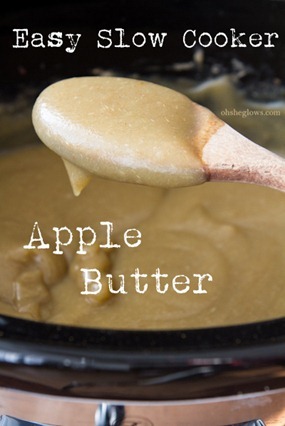 We tried this apple butter recipe today and loved it! Thanks for posting! I love that you make it without sugar. I’m going to do that when making for my family. I was very happy to find this recipe on Pinterest and made my first batch yesterday. For those of you who want to can: I called my dad to borrow his canner and he asked if the apple butter would be hot when I put it in the jars. I told him yes and he said I could put the lids and bands on tight and cover the jars with a towel and they would seal. I did and all five jars sealed! Thanks again for the recipe!!! I also go the no sugar added route, and it turns out fantastic. I also can it, as apples are quite acidic and the fact it’s being reduced only increases the acidity level in the butter. Can it 10 minutes in a hot water bath and you’re done. I am curious though, how you were able to keep the color that light? If I were to use apple cider (since I have it on hand), how much should I use? Would I still need the lemon juice? I need to make 20 (8 oz) jars, how many jars does this recipe make? Did you ever figure out how long it lasts in the fridge for? Thanks! I think it lasts at least a few weeks :) enjoy! This looks so good!!! I was wondering, what would you eat this with typically for a meal? This sounds absolutely delicious! I’ve made applesauce before but never thought about making apple butter (though recently I’ve been trying to think of a way to recreate Trader Joe’s fig butter just to see if I can.) 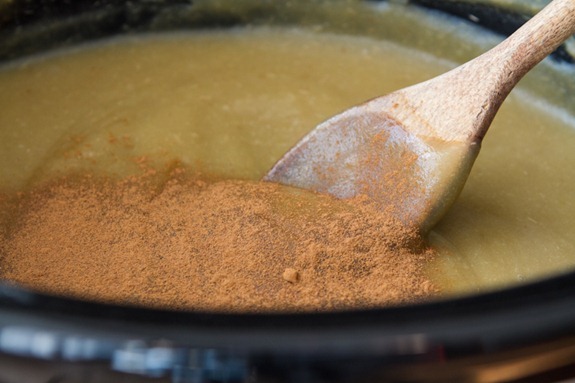 Anyway, I like the idea of using just apples and cinnamon and maybe some lemon juice and just use the bare minimum or leave the sugar out altogether (that’s basically how I do applesauce), and I agree about leaving the peels on. 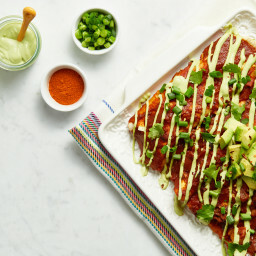 The only question I have is, since I don’t have a slow cooker, is there any way to make this on the stove or in the oven? Hi! Just want to ask you if you tried to preserve this apple butter? Not sure if I can do it without any sugar? What about pressure canning? Could it be done that way? I don’t know what I’m doing wrong! I have made this twice now and everything seems to be going great until I finish blending and there are these thin apple fibres that look (and kind of taste) like splinters! Did anyone else have this? How do I get rid of it? Hey Leah, I think this would be a result of the blender. I recommend using a high speed blender – some just might not be able to get the apple pulverized enough. Anyway I hope it was enjoyed regardless! I would suggest peeling the apples next time if your blender can’t blend them enough. All my best! thanks for the quick reply! I ended up straining all of it! it took a while but once it was strained, it was so creamy and perfect! i put it back in the slow cooker for several hours and it tastes AMAZING!!!! This is my fist time making apple butter. I have never used apple butter so now I need ideas for where I can put this yummy apple butter. Any ideas other than the oatmeal? this looks yummy but i was just wondering how you would eat this / what would you eat with it? Yeah, I’m wondering too. i see this for sale all over but don’t really see many recipes that tell you what to do with it. It’s amazing on toast! That’s how I’ll usually eat it. If I made pancakes I’ll usually have it on one of those as well. Do you need to core the apples or remove the seeds? I just made this yesterday and it came out AMAZING!! No sugar needed, which was so great because Im totally off sugar right now. It doesnt need it!. I froze the rest in individual freezer bags for later use. So easy, cant thank you enough! Hi I am a novice when it comes to making fruit butters & jellies, can you tell me is it necessary that canning takes place & why..thank you. Even though this post is old, I found it while hunting for Apple butter recipes. My 90+ year old dad will love it. He is diabetic and the no sugar added version is just what he needs. My significant other is also a big fan of butters. All that’s needed is some warm fried biscuits to smear it on! I used a combo of Jonathan and Macintosh apples, with the skin on. I also used my immersion blender right in the crockpot. No problems, no burns. Turned out pretty smooth with just few small lumps. Acceptable to me. My question is: in freezing the butter, what do you put it in ? Someone mentioned jars. Glass or plastic? How much room is needed for expansion as it freezes? Thx for the recipe and all the other ideas to try. I am trying this apple butter recipe tonight. Added some apple juice to my own apples… some sweeter and some very tart. Would love to try some peach or pear with the apples. Love pumpkin so would try that too. Oh my. As long as there is no added sugar…ie: refined sugar… I would give it a try. Recently became diabetic, so I am experimenting with no sugar recipes in hopes that it keeps my glucose levels down. Seems to be working so far. Long time fan of the site! I’m cooking down apples from our nice neighbors right now… And we’re all excited to have homemade organic Apple butter! Thanks for all the great recipes and cooking tips! We don’t do much canning over here in England. I haven’t checked all the posts, but I wondered how long your Apple Butter lasted without canning? Hi Louise, I’ve found it lasts up to 2 months in the fridge! Wow! What a great, easy to make recipe. I just made this today and it was delicious. It was so sweet, I can’t imagine people adding sugar to it as I’ve seen in other recipes. Apples and cinnamon was plenty sweet for me. And who can argue with not having to peel the apples? My high speed blender really pulverized everything up very fine, though I still found small, thin shreds of peel in it. What I did was pass it through a super-fine strainer which did the trick. Thanks for sharing this recipe! Easy and best recipe for apple butter! I made this last year and froze in tupperware and small mason jars. Just finished my first batch for this year right now and smells amazing! Thx!! I made a batch of this in February 2017, poured it into mason jars hot. They sealed themselves down very tight, but I still kept them all in the frig. I just finished the last jar this week, and still delicious! 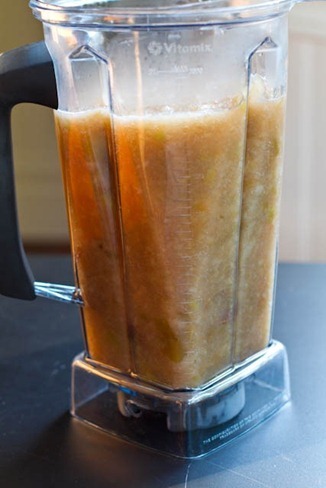 I use an immersion blender to puree the apples, way simpler than a blender. Making a new batch today. 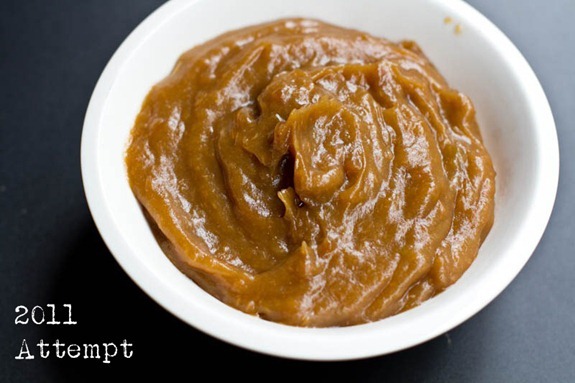 Hey Kathy, I’m so glad you’ve been enjoying this apple butter recipe! Have fun making your second batch. This is incredible! Is there an Oh She Glows Slow Cooker Cookbook pending? That would be wonderful because I love my slow cooker and your recipes are my favourites! I own all your cookbooks and would love to have more! Aww thanks Shannon! :) So glad to hear you love the apple butter. I just bought an Instant Pot and wow and I ever having fun with it trying to convert old OSG recipes. Nice recipe – I really appreciate the simplicity. However I wound up having to cook it for an additional 4 hrs to get it to an actual apple butter consistency vs. apple sauce.